Smartphone sales are in a bit of a holding pattern heading into the holiday season, according to data gathered by Gartner, an information technology research company. A look inside quarterly sales numbers showed smartphones are up 46.9 percent over the same period in 2011, and revealed Android phones outpaced Apple's iOS handsets by 5:1 during the third quarter. The sales figures show mobile phone sales have decreased by 3 percent overall, continuing a trend started earlier this year. Despite the overall sales dipping, smartphone sales bolstered by Samsung, Nokia and Apple have continued to escalate and are now responsible for almost 40 percent of all mobile phone sales. 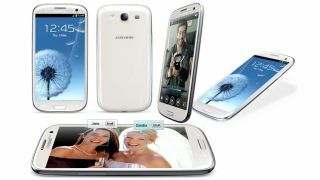 Samsung was able to maintain its lead over Apple in smartphone sales during the third quarter, due largely to its Galaxy lineup, including the Galaxy SIII. With a 32.5 percent share of the smartphone market, Samsung held off second-place Apple, which earned 14 percent of sales. Research in Motion slipped into third place, with HTC following closely behind, as Nokia's smartphone sales tripped down to seventh. Samsung still found itself in the overall lead with 97.9 million phones sold (22.9 percent), a narrow margin of victory over Nokia's 82 million total mobile phones sold (19.2 percent). Apple was able to solidify third place by selling 23.5 million iPhones (3.9 percent), which was a 36.3 percent jump from 2011, and accounted for the largest increase in year-over-year sales. Gartner expected Apple to have another traditionally strong fourth quarter due to the expanding availability of the iPhone 5, but doesn't think holiday sales will impact the overall market all that much. Even though iPhone sales increased tremendously during the third quarter, Apple's iOS still had trouble catching up to Android. With 122 million Android phones sold during the third quarter, Google's OS increased its share to 72.4 percent of the market. Despite Android earning 20 percent more users during the third quarter, iOS was still able to garner 13.9 percent of all users, a drop of just one percent from Q2. Apple maintained second place largely thanks to the decreasing numbers of Symbian and Microsoft's Windows Phone 7, as both OS are being phased out for Windows Phone 8.
iOS is expected to increase its numbers during the fourth quarter, according to Gartner analysts, but all that depends on how strong Apple's final quarter turns out from a sales perspective.